Donny was found wandering around a parking lot when he was just a kitten, very sick and in desperate need of help. He was rescued by North Shore Animal League America in New York, where staffers worked incredibly hard to nurse him back to health. Unfortunately, Donny’s eyes were underdeveloped and useless to him, so his rescuers made the decision to have his eyes removed. Not long after his surgery, it was discovered that Donny also suffers from cerebellar hypoplasia, a neurological condition which causes him severe balance issues. 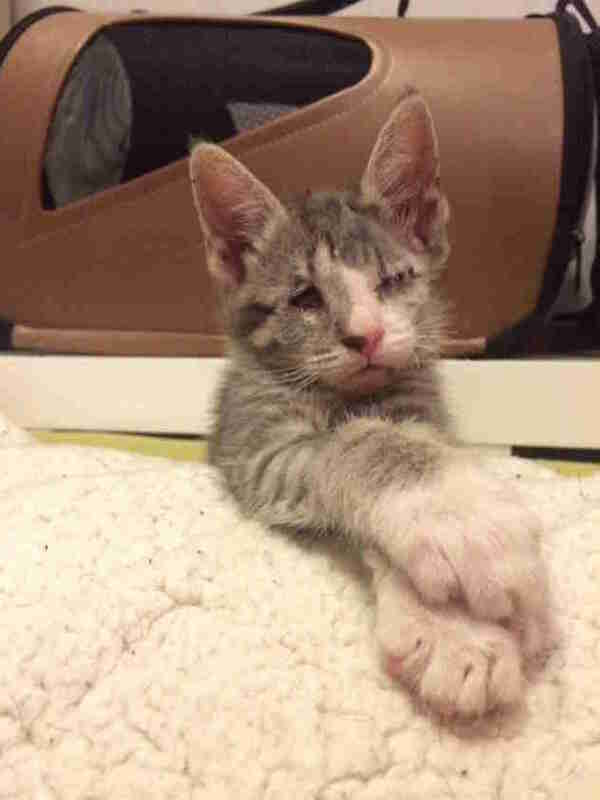 The blind, wobbly cat was put into a foster home with Beth Stern, an avid fosterer, to wait for his forever family to find him. 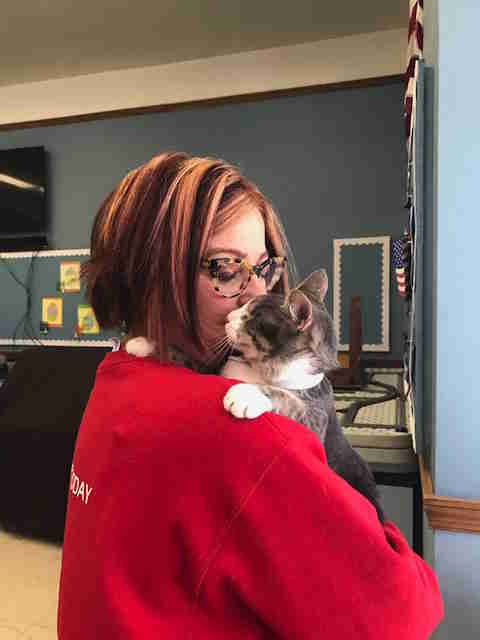 While it can sometimes be harder to find homes for special needs animals, it didn’t take long for the perfect person to stumble across Donny. Susan Smith was scrolling through Instagram in March 2016 when she saw a post about Donny and instantly fell in love with him. 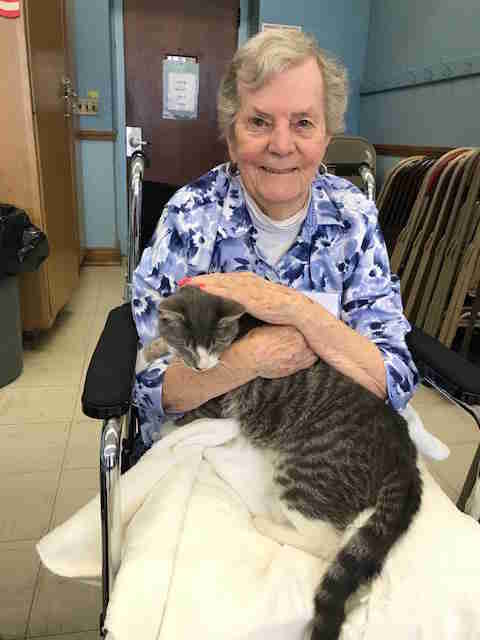 Even though she and her husband weren’t looking to adopt another cat, they decided to go and meet him anyway — and when they did, they immediately knew he was coming home with them. From the minute Donny arrived at his new home, his mom could tell there was something special about him. Right from the very beginning, he’s been the most loving, gentle cat, and always shocks his family with how laid-back and happy he is. Despite everything he’s been through, he seems to have no idea he’s any different, and powers through each challenge life throws at him as if he never noticed it was a challenge to begin with. Everyone who meets Donny comments on how easygoing he is, so his mom decided to try enrolling him as a therapy cat. She knew he had the right temperament to be handled by people and hoped the role would be a good fit for him — but could have never imagined just how much he was meant to do this. Donny mostly visits elderly patients who have Alzheimer’s disease and dementia, and may start working in libraries and schools soon, too. 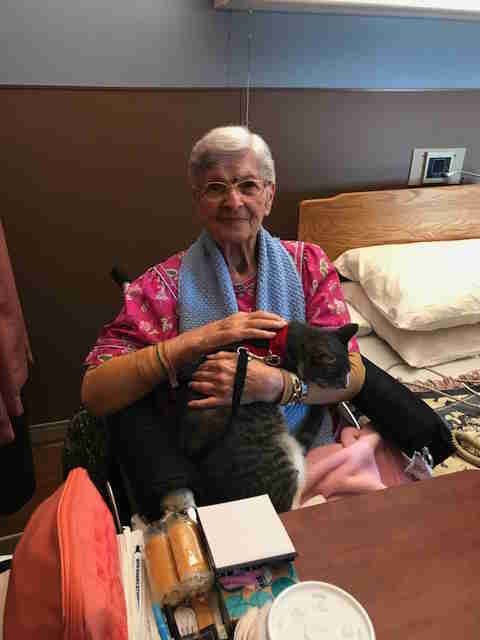 His main job as a therapy cat is to bond with patients by sitting in their laps and bringing them some much-needed comfort, and he truly seems to adore his very important job. When Donny’s grandmother (Smith’s mother) was diagnosed with lung cancer and started spending a lot of time in the hospital, Smith immediately knew who the perfect candidate was to help cheer her up. 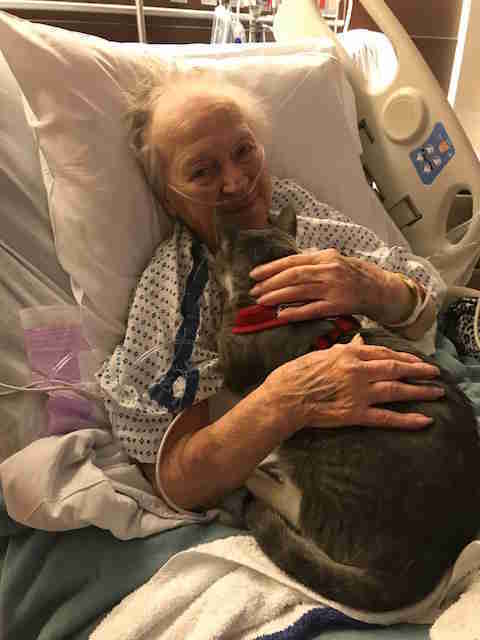 She started bringing Donny to the hospital regularly to visit his grandma, and it was incredible just how much the sweet blind cat seemed to help her. Donny’s grandma’s cancer was initially very aggressive, but the tumor ended up shrinking much faster than the family thought it would — and she is now, miraculously, cancer-free. 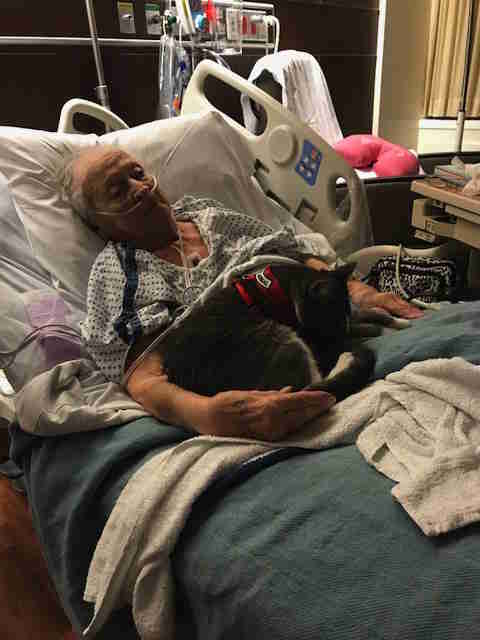 Donny was able to keep his grandma’s spirits up while she was in the hospital and recovering at home, and his mom thinks that played a big part in her overall health. Donny has no idea that his life has been a little more challenging than the lives of most cats, and his positive attitude inspires people every day. 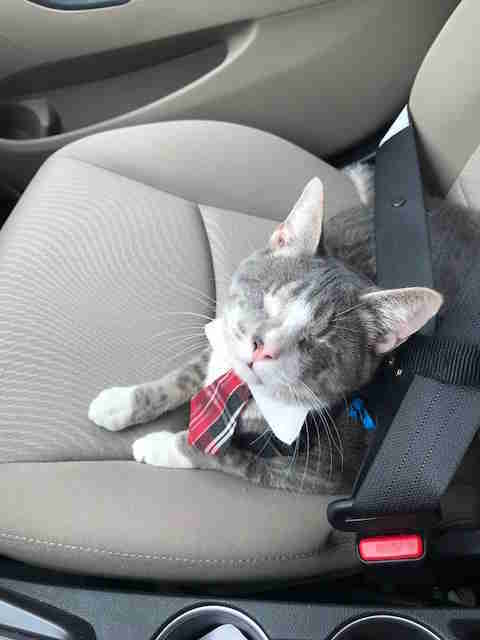 He loves showing people that anything is possible, and will continue to help and support everyone around him through his work as the world’s best therapy cat. You can follow Donny on his family’s Instagram account.